Hi. My name is Bernard. 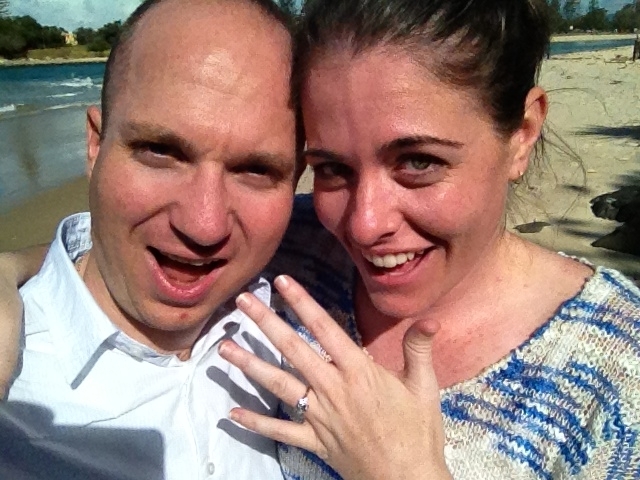 I live in Sydney Australia…and I just got engaged. This is my attempt to record the journey that is going to take place from 29 May to 29 December 2012 when my new wife and I will walk down the aisle together. I have only been engaged for six days and in those days my mind has been working in overdrive to understand what has taken place. So let me begin this first entry with a few background details. I met Jane – my new fiancée – at work late last year. For me it was not instant love but we soon became friendly and I eventually realised I was spending an inordinate amount of time crafting witty emails in response to her even wittier emails. Still not knowing completely how I felt, we began dating at the start of this year and within a month we were ‘going out’. We both very much enjoyed our time together and have steadily grown in our feelings for one another. Within three months our conversations turned to the idea of marriage. I have never been one to be indecisive and being 32 years old I was not going to take two or three years to discern a potential spouse. Jane was also in the relationship with a serious view to discerning marriage. A couple of weeks before I proposed it became clear that we were both prepared to move to the next step. Certainly four months is a very short time before proposing and there would have been no harm in waiting a few more months. However I decided to get myself a ring and prepare to ‘pop the question’. At Easter I had bought a couple of plane tickets to the Gold Coast with the idea, at the time, of a day trip to celebrate four months together. This trip turned out to become my chosen day. With the engagement ring buried in the bottom of my bag (thankfully she wasn’t watching the x-ray screen at the airport) we boarded our plane for the Gold Coast. I decided to spend the day at Burleigh Heads, a small but popular coastal town, and had done as much research as I could via the internet (God bless Google). We had lunch before embarking upon a walk through Burleigh Heads National Park. Before we walked into the park I stopped to rustle through my backpack to find some ‘lip balm’ while I covertly relocated the ring box to the top of the bag. I was unsure what the actual park would look like so when we found a small private beach off the track I immediately realised this was the place. While Jane was busy collecting shells and skimming stones into the water my stomach was churning as I tried to recall the few lines I had jotted down the night before. With a pocket full of shells she sat on a large rock while I stood and shared some words about how I felt. I fell to one knee and continued my little spiel trying not to rush the moment but also grasping for the right words (I am sure I tried to make use of the word ‘love’ a few times). Jane was looking down at me smiling, and as I was to later learn, wondering in her head if this was the moment. I produced the ring and asked her to marry me and she replied calmly and deliberately, “Yes Bernard. I would love to marry you.” Phew!! Job done!! And at that very moment, for two people on that little beach just off the Coral Sea, a new era was created. While the rest of the world was moving along as always – laughing, crying, sleeping, dying – I offered to Jane my desire to love her for not just a day or a month or a year but for a lifetime, and Jane accepted my proposal. We walked onto that beach as a guy and a girl but we walked off that beach with a new common goal; a desire to walk together on a path that would lead us to eventually sharing our hearts, souls and very bodies. Posted in Uncategorized and tagged engagement, marriage, proposal, ring, surprise. Bookmark the permalink. Bernard and Jane, May the Lord God bless your love, for ever. Such an exciting journey and time for both of you. LOVE that you have decided to keep a record of this Bernard! Our prayers will be with you both in this amazing preparation time for a life full of a love and joy that is indescribable! I am so happy for you both!!!!! God Bless you!!!! The world loves lovers. The Church, the body of Christ cherishes them and gives this love a sure path to fulfilment, with true dialogue our way of hope (do we not believe in the Trinity, the dialogos!) as people drawn to transcendence and by the immanence of Our Father in our lives. I am inspired by you! Goosebumps rose on my skin as you spoke of the climactic moment of Christ’s life on earth – the betrothal of your souls, hearts, minds, bodies. The saints walk with you, thankyou for leading us in love!